This easy kamado BBQ beef recipe is for steak, preferably rib-eye (my favourite) and for cooking it on the ceramic barbecue grill. What this means in real terms is that rather than cooking one side of a steak at a time you're actually cooking all round it at the same time. You don't get the grill marks but you really can get a good smokey steak, juicy texture and you can also afford to cook thicker steaks without fear of them being raw in the middle (unless that's the way you like them!). First off use this link to learn more about how to grill steaks to perfection. 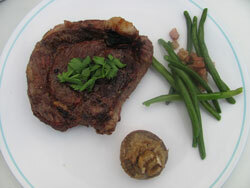 Don't buy your steak down the supermarket, it won't be thick enough so get to your butcher. It might be more expensive but that's because there's less water in it, the cooked weight will be more or less the same when the water is driven off and your butchers steak, because it's been allow to hang for a couple of weeks will just taste so much better. ....And while I'm climbing down off my soapbox, this BBQ beef recipe needs a thick steak to do it justice so get your butcher to cut them about 35mm or 1½ inches thick. When you get your steaks home, take them out of the wrapping and place them on a cake cooling tray in the refrigerator for 24 - 48 hours so that they can dry out a little. If you can hang them so that they dry quicker then all the better. This kamado BBQ beef recipe has a light seasoning rub and the reason for that is that this is more about kamado cooking and a different process for cooking steaks on the ceramic barbecue grill. The next thing you need is a Kamado style barbecue grill cranked up to 340°C or 650°F. You don't need heaps of coal to get up to this temperature, just make sure that the grate is clear before you start to ensure that you can get a good airflow. All raw ingredients for this recipe, nothing processed so no allergens. Mix all the ingredients above with the exception of the black pepper, apply all over one side of the steaks and allow them to stand for 30 mins. Not only will this give the rub time to penetrate it's also allow the meat to come up to room temperature. Note:- I suggest only seasoning one side of a steak because the seasoning layer acts a a barrier to the heat of the grill and we want to keep the cooking as hot as possible. Seasoning on one side is an acceptable trade off between the flavor from the cooking and the enhancement from the seasoning. Note:- Timings on this kamado bbq beef recipe are for a rare steak the way I like it. Cook and learn how long to do yours and a temperature probe always helps. Now slap the steaks on the grill for 4 minutes with the lid closed and the dampers open so that you sear them really well on the outside. After two minutes lift the lid carefully so that you don't get a flare up, flip the steaks and sprinkle the cracked black pepper on the freshly seared surface. When you have turned the steaks onto their second side, sprinkle on the pepper (this ensures that the pepper flavours the steak but doesn't scorch). Once the searing is complete on the second side, just close the dampers and let the steak smoke for 4 minutes and that’s it. You may want to add 3 or 4 minutes if your prefer your steak more well done. Because I like my kamado BBQ beef rare so I look for 55°C (130°F) on the temperature probe. When you remove your smokey steak from the kamado always let it rest for 5 minutes before tucking in and that’ll be just enough time break out a bottle and pour a large glass of shiraz!